They start out identical and end up as different from one other as imaginable. An exercise in creativity, individuality and community, Gallery Route One's annual "Box Show" brings together an eclectic mix of artists to create something out of nothing. Now in its 13th year, the popular exhibit gives 150 participants similar wooden boxes to decorate at the beginning of June. Two months later, the boxes come back as works of art, decorated with paint, adorned with sculptures or hooked up to lights. "There is something for everyone," says Vickisa, head of publicity for Gallery Route One, a nonprofit artist-run arts organization in Point Reyes. "It's always different and it varies in so many ways, it's indescribable." Veteran artists are given the opportunity to return each year, while new participants are chosen out of a lottery—usually of about 400 applicants. When people are chosen, "we don't know what their age is or if they are artists or what they do. That makes this more unique than an art show with professional artists," says Betty Woolfolk, the gallery's executive director. Participants range from 16 to 80-plus years of age and come from all backgrounds. The show was founded in 1999, when artist Nick Corcoran envisioned the idea as a gallery fundraiser. A carpenter and woodworker, Corcoran made all 150 boxes to support the event. He has continued to do so every year since except one, while Woolfolk takes on the administrative aspects. "It has really taken on a life of its own," says Woolfolk. "There are so many people involved from the community and the Bay Area." Vickisa adds that the sense of camaraderie between the artists, as well as the community, is one of the biggest motivating factors of the project. She describes the show as being especially kid-friendly due to its variety. The simple wooden boxes return to the gallery nearly unrecognizable—flattened, built upon, covered in mosaic, painted, illuminated or containing entire worlds within. Many of the boxes are made in a diorama fashion with scenes built inside. In 2009, one box was turned into a house with a working door so the viewer could see all the furnished rooms inside. 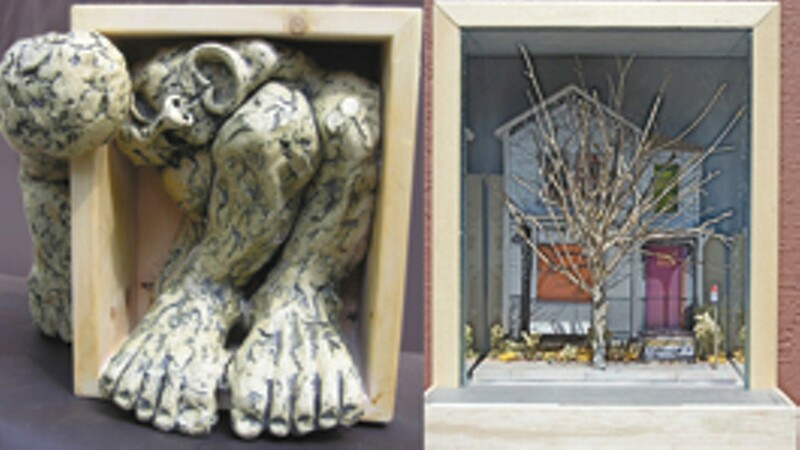 Many artists sculpt the boxes or add figurines and other objects to them; almost no box is without a few adornments. One past box was covered with an actual road sign that had a stuffed squirrel running across it in search of food. The show runs every day for six weeks, during which time the gallery sees about half of its yearly visitors. At the closing party, a live auction is held for the boxes. The bids start at $25, and Woolfolk says the gallery usually grosses about $18,000. All proceeds go to support the nonprofit gallery and its Art in the Schools program. "This show explains art in so many different ways," says Vickisa. "You will see people talking about it, thinking about it and having the best time at the gallery with this show. It's incredible." The 13th Annual Box Show runs Aug. 12-Sept. 18 with an opening reception on Sunday, Aug. 14, from 3-5pm, at Gallery Route One. 11101 Hwy. 1, Point Reyes. Closing party and live auction on Sunday, Sept. 18, at 2pm. 415.663.1347.